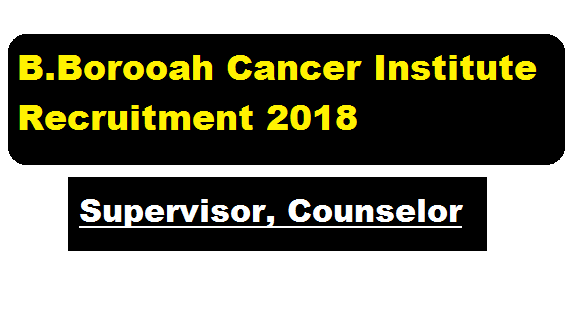 B Borooah Cancer Institute Recruitment 2018 [Guwahati] | Supervisor & Counselor-24 Posts : Hello Dear all. Hope you are getting our regular Assam Job News & Updates on time. In this article we will be discussing about the latest Recruitment in Dr. Bhubaneswar Borooah Cancer Institute (BBCI), Guwahati. According to the latest Dr. B. Borooah Cancer Institute Recruitment 2018 official notification, Applications are invited from the eligible candidates (Indian Nationals only) in prescribed format for the following contractual posts for Ministry of Health & Family Welfare, Govt. of India sponsored project “Regional Satellite Centre of Tobacco Quitline Services at Dr. B. Borooah Cancer Institute, Guwahati”. In this section, we will discuss in detail about Recruitment of various posts under B. Borooah Cancer Institute Recruitment 2018 with all the details and requirement. Candidates must be Post Graduate in public health or social work or management of related field from a recognized university. i) At least 3-5 years of work experience in the health sector. ii) Experience in tobacco control issues and knowledge about international / national tobacco control policies and health programs will be given preference. iii) The person should fluency in speaking / writing Hindi & English. iv) Knowledge of basic computer application. i) Graduation in psychology / social work from recognized university. ii) The person should be fluent in speaking / writing Hindi & English . i) PG in psychology / social work with experience in tobacco related work. personal CV through e-mail to “bbci_info@yahoo.co.in. Incomplete applications will not be considered. The last date for receipt of applications is 1st August 2018.
in the Conference Hall of the Institute. No separate call letter will be issued to the candidates. 1/ Selected candidates will have to join in the respective post within 13th August 2018. 2/ Please note that the appointment to be made is purely temporary and for the duration of the project. There is no right for claiming any regular appointment in the BBCI. 4/ The decision of the Institute as to eligibility or otherwise of a candidate will be final. on them to be called for test / interview. 6/ No TA/DA will be paid for attending the interview.